1. Submarines: You, Me, & the Bourgeoisie (otherwise known as “That 3G Iphone Commercial Song”). 2. Calexico: Convict Pool. I’ve probably posted this before, but I just can’t get enough of this song…going on 2 years now. 3. Rodrigo and Gabriela: Tamacun. Now, I like good Spanish Guitar music, but THIS is GREAT Spanish Guitar music. Undoubtedly, you’ve heard this somewhere and will recognize it when you hear it. I know, for example, that they play this song in Disney’s California Adventure Theme Park in the eating area next to the Mission Tortilla Factory. 4. Ferraby Lionheart: The Ballad of Gus and Sam. Cool band name. Great song. 5. Band of Horses: Funeral. Otherwise known as “That Song on the Saturn Car Commercial”. 6. Band of Horses: No One’s Gonna Love You. Still love this song, and am still amazed that a band would offer it’s best stuff for free. Kudos to the Horse Men. 7. Arcade Fire: Black Mirror. My introduction to Arcade Fire..and I’ve never looked back. Fantastic song…and nice use of a Phantom of the Opera lick. Also, with this one, I wouldn’t stop at the free download. Buy the album. Neon Bible is probably one of the best Indie albums of the last 10 years. 8. PT Walkley: Somebody. Just found this one on Spinner.com’s Free MP3 of the Day. Fascinating piece. Best use of violins, IMO, since Jump Little Children’s “Cathedrals”. Crooked Fingers – Phony Revolution(from Glider Magazine) – I may not know what on earth they’re saying at the end of the song, but this one has such a unique but exciting sound, I had to put this one at the top. Calexico – Convict Pool (From Download.com) – This is older, but I still think it’s one of the absolute best online Indie has to offer. Barcelona – First Floor, People – This is one of two songs you get from the secret download page for Barcelona–what an entrancing song. Army Navy – Saints (from Spinner.com) – Classic alternative beat and guitar licks. Loud but not annoying. Even uncharacteristically catchy and dare I say, radio-friendly? nah. I think what most draws me to the music of Calexico is its melodramatic tones underscored by the moving Spanish and Flamenco rhythm. This means that sometimes their music can be dreadfully boring and depressing, while, at other times, it can be simply entrancing, like a long ride into the deserts of Arizona with nothing but the cactii and nothingness, but at the same time, accompanied with a peace that this is life at its most simple. It can be moving and haunting, and jazzy and exciting at the same time. So, when I had the chance to get a listen into Calexicos’ latest album, it was enough to break me away from doctoral qualifying exams. Carried to Dust is their latest release, and at first listen, I have to say it’s more American low-fi rock with a texarkana flair than the usual Calexico fare. In fact, some songs are simply non-Calexico, like Two Silver Trees. Sure, it’s catchy, but it sounds like something from the Finn brothers (Crowded House) or even Tears for Fears. Is that bad? I don’t know. I can say there are some very haunting melodies reminiscent of classic Calexico, like Writer’s Minor Holiday and News About William. 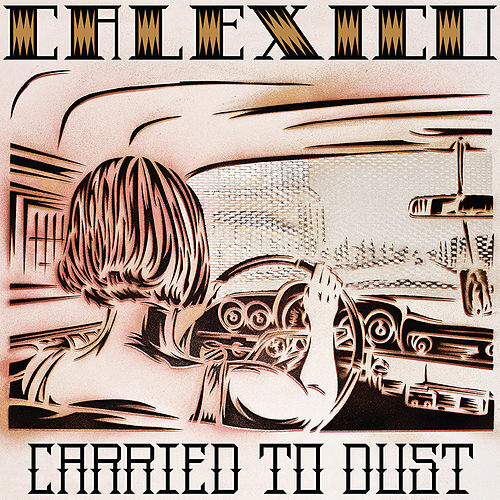 If you’re a Calexico fan, you won’t be disappointed. If you’re making your first foray into Calexico, I’d recommend The Black Light, or Garden Ruin. Calexico’s best songs, in my opinion, are Convict Pool and Crystal Frontier (which I believe you can get off of music.download.com).